Janet Zeh Art Blog - paintings of birds, flowers, seascapes and country landscapes. Here is another scene from my garden. 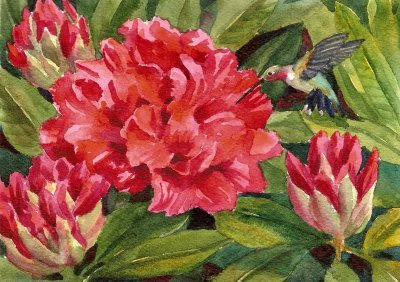 I had planned to paint the rhododendron but had not thought of adding a hummingbird. However the other evening, as I looked out my kitchen window, I saw one buzzing around my red rhododendron which is absolutely so full of blooms that it amazes me. My azaleas are blooming exceptionally well this year too. Normally, the rhodies and azaleas have significant winter kill which cuts down on their blooms. It takes a while for the plants to recover from a winter of subzero temps. This spring I noticed that none of them had any winter stress at all. And, now that I think of it, though the winter seemed long, snowy and cold, we never had the minus twenty night temperatures that normally occur in January and February. Perhaps it's global warming. Maybe there's a bright side to that - I won't have to move south to have beautiful rhodies and azaleas! This painting has been sold. I'm happy to take custom orders! Contact Me to have a painting or print made just for you. Have you ever wanted to spend every day doing what you love? I hope you are doing that! As for me, I am grateful for the chance to do what I love every day: paint the beauty of nature, including that of my native New England and places I have traveled. In this blog, I share with you some of my small daily paintings and demonstrations of larger works and pet portraits. All Content & Images Copyright © Janet Zeh 2016. Powered by Blogger.